Shibata 180 Bunka with Karelian Birch/Bog Oak/ Satinwood. This is a top notch performer with a stunning handle. Do you like the general layout, or the ironwood burl specifically? I am willing to bet the owner could be convinced to part with enough wood to make a handle or two. Sounds like a plan. Thank you. And now for your viewing pleasure, a Ikeda honyaki 240 gyuto with Honduras rosewood burl/maple spacers/bog oak. Now this knife looks as good as it cuts! ...Now this knife looks as good as it cuts! Fancy pants spalted maple with Blackwood and maple accents on a Tojiro nakiri. Wow. I was charged with making the FUGLIEST handle. I laminated scraps from various handles together, and lined some of the scraps with aluminum foil. How did I do? Ben that is the COOLEST FUGLIEST handle I think I've seen, you just keep raising the bar! Thank you! There was some talk in one of the Instagram posts, I think it was the @Ben_makes account about getting some handlemakers to try an ugly handle contest. I am motivated to make some chaos blocks based on off cut scraps. This Tsourkan petty came in with lefty D handle. The owner thought the maker was so backlogged that a new handle would take too long. I switched this out for a tapered octagonal handle made from stabilized Redwood burl and ebony. I was told the knife looked stunning and felt natural in the hand. Especially loved seeing those cleavers all dressed up. 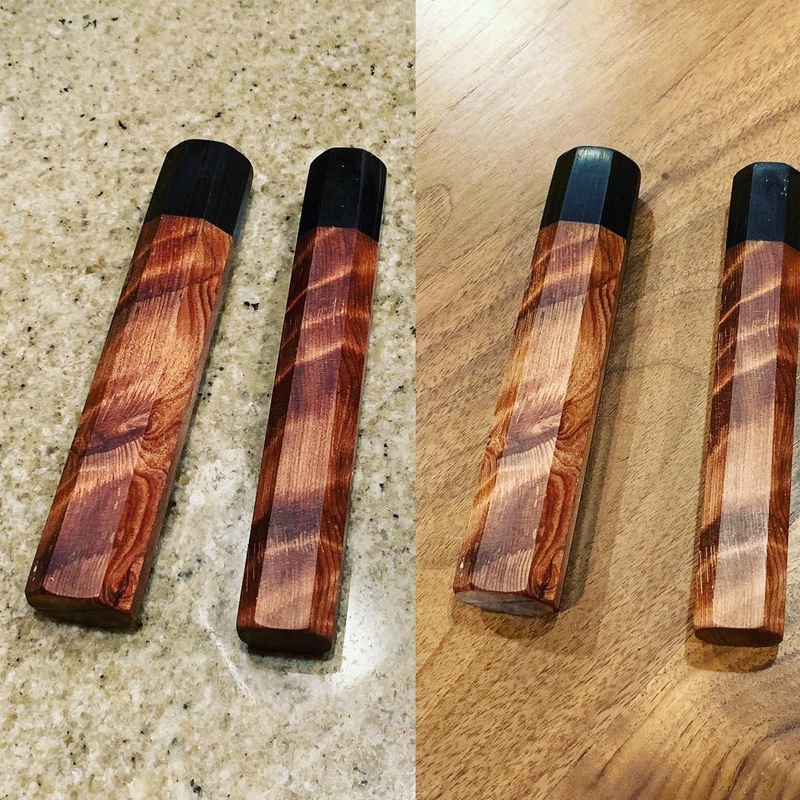 A new set of handles landed in a client’s hands. Stay tuned for more while you enjoy this one. Moritaka Cleaver with a new handle made from black palm, maple spacers and maple burl. Happy Thanksgiving! I am thankful for so many things, including excellent clients that find me online. Enjoy this DOI gyuto with an leopardwood/maple/ironwood burl upgraded handle. Not sure if anyone else has this problem, but on my mobile Android phone, the only pics I can see in this thread are from June 6 and June 8. I can see them when I get to a desktop computer though. You don't have to change anything on my account, just wanted to give you a heads up. Cheers! I am sorry about that. I know it has to do with my posting Instagram links vs 3rd party hosting and separate uploads. There are reasons why I keep doing it this way. Stunning! This black and white ebony handle with maple and leopardwood spacers matches the Shiraki honyaki Yanagiba. I am stunned at how well this spalted stabilized aspen turned out. The figure/color/grain are just perfect. The Moritaka santoku isn’t bad either. The aspen was complimented by bog oak and maple.